Author David Murrow asserts that the rapid loss of men in the protestant faith over the last 50 years is due to the unintentional feminization of the church. Murrow tries to put his finger on the pulse of what does. A few take-a-ways: Murrow pushes heavily on challenging men. He has lived all over the United States in six different states and Germany. Nothing could be farther from the truth. But what about a third option: churches will attract people both men and women when the true gospel is preached and believed and lived out. On any given Sunday 13 million more women go to church than men and the gender gap is widening across all denominations. As a woman, I can't say I like that. I am bummed if I miss church. I think he was trying to make sure this discussion was relevant to every denomination, but he touched on some pretty controversial issues without taking a stance on them one way or another - I guess I just wish that there was more of a biblical basis or statement to accompany some of these hot-button issues. What does the Bible tells us about the nature, function, and purpose of the church? And the women have an equally strong place in both direction and ministry. Thanks to Thomas Nelson via Booksneeze for giving me this review copy in exchange for my review. This author tells me that they're just acting the way God made them and we women shouldn't keep trying to feminize them. The author may over generalize too much for my taste, but his point is well taken. Morrow makes many good points. Murrow utilizes Men Are From Mars, Women are From Venus to make his point that culturally, the Church is seen as feminine. If you bring in women, you will have a congregation of women and children. I though this was not the case until I started counting heads each Sunday. What are the top 5 reasons why many men hate going to church as we know it? 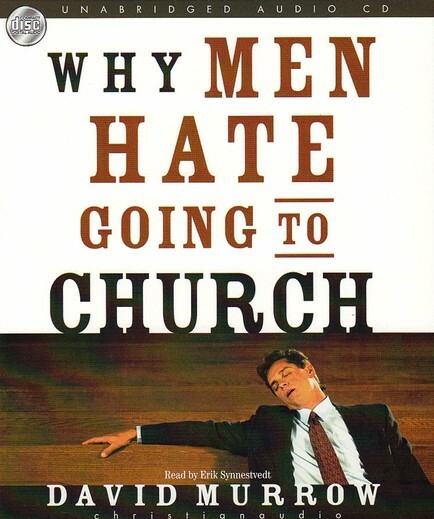 Let me just suggest three reasons why: 1 Ultimately the theme of the book is that men don't go to church. The author says women interact face-to-face and men side-by-side. Men need to be convinced of relevance to invest their time, energy and money. 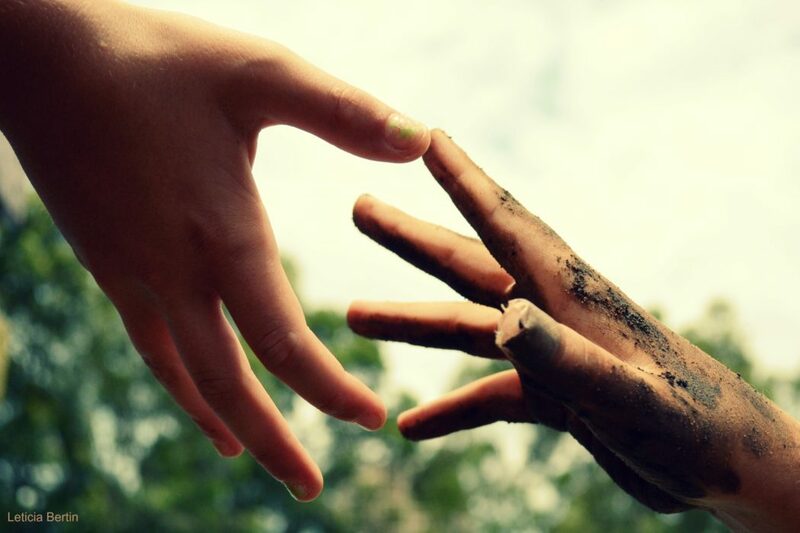 Yes, churches must strive to reach men, but no one men, women, or children will ever be interested in church for the right reasons unless they are confronted with their sin and are led to repentance by the power of the Spirit. Imagine a gang member saying to one of his brothers, 'Blade, would you please share with us how you jacked that Mercedes? They just sing louder to make up for the fact that no one else is singing. Instead of addressing the issue of young boys and men with their shortcomings in the education system, David Murrow addresses the trend of spiritual undernourishment in boys and men in the churches of Christianity. You have to read on to find out what can be done about this situation. Louis and the highest-ranking American in the Vatican under Pope Benedict, gave a this month decrying the feminization of the Roman Catholic church. It is true, funny, and well researched. Churches have shifted toward a style that is comfortable for the stereotypical woman—at the expense of the stereotypical man. It is not our masculinity that keeps us from God, it's our rebellion against him. No, but among the various factors that keep men out of the pews, Murrow finds that the church have soft-pedaled parts of the gospel painting Jesus as the gentle lamb of God without also showing us that He is the Lion of Judah, ferocious and wild. He argues that men like things such as competition, nature, challenges, short sermons, etc. If you think that's unlikely, but don't understand why and want to know mote, then this is the book for you. Put me somewhere in the middle. 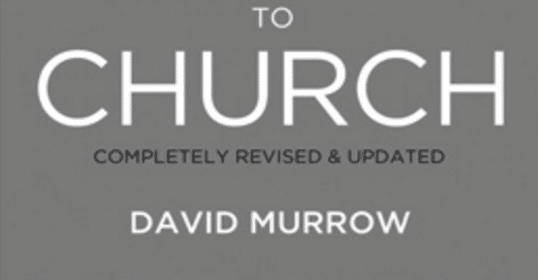 With eye-opening research and a persuasive grasp on the facts, Murrow explains the problem and offers hope and encouragement to women, pastors, and men. 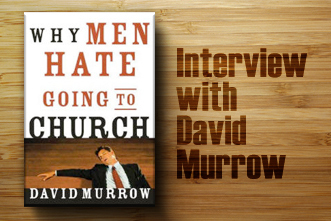 Murrow in this text uncovers the gender gap in churches, asking the question where are the men?. Murrow posits a number of historical and cultural reasons why this problem exists, and ultimately makes some limited suggestions about what can be done to tweak our churches to make them more man-friendly. I felt judged whilst reading it, and that my feminine qualities were somehow the reason men couldn't worship alongside me. Now both Catholics and evangelicals are worried about the man crisis in church and have drawn headlines because of it. 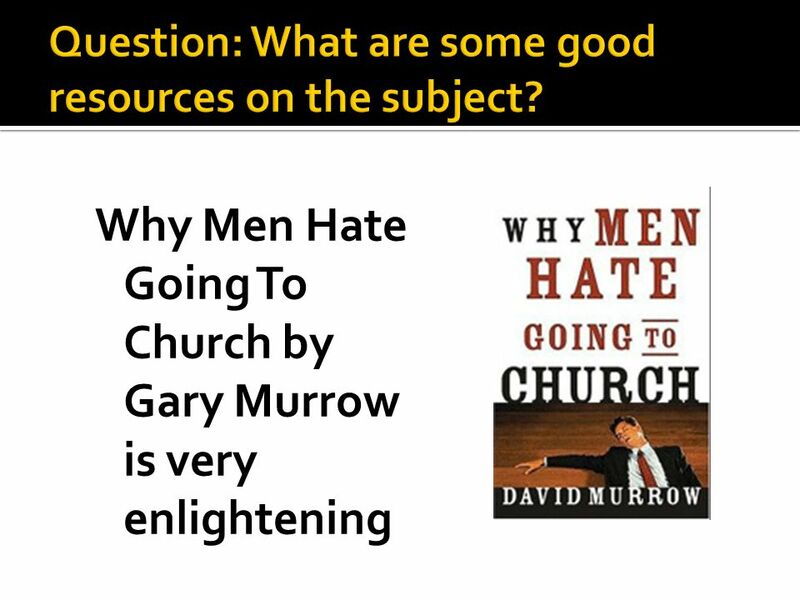 In this updated edition of his 2005 book Why Men Hate Going to Church David Murrow has addressed a real, verifiable problem. That also translates into attendance at worship services, Dant said. Murrow's bestseller on the topic came out a decade ago. The number one killer of fifteen- to twenty-four-year-old males is accidents. When a man comes to know Jesus he will find a church to go to, for all its many flaws. 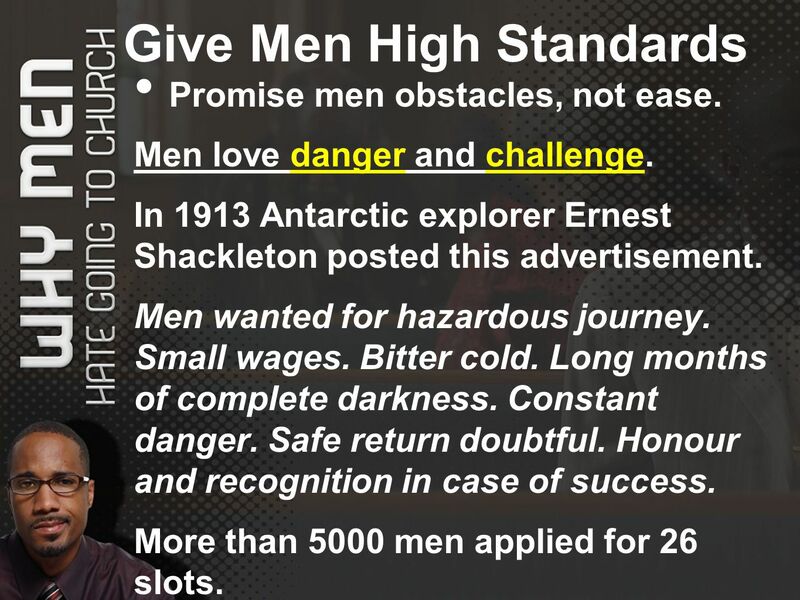 So, there are exceptions to what Murrow describes, but the generalizations are widespread enough that leaders should take notice of this book and assess how their ministries are attracting or repelling men and boys.